Today I’m sharing some recent projects. I’m not much of a DIYer.. but, I do make Pillow Slip Covers… yeah - I sew a little. Just this week I made these two covers. I’m psyched at how they turned out and happy to bring some more blue and white into the livingroom. I remember the first time I made a cover years ago and how much work it was - man I was clueless but, like most things I figured it out. Iron to make your edges crisp. Pin edges and remeasure. Take your time. This step is critical. You may need to adjust and use the iron again. Again keeping in mind that you need to make the cover smaller than the actual pillow form. Turn the fabric inside out and prep to start sewing. Turn right side out paying close attention to fully pushing out the corners. Insert pillow form and voila! Like I said I am not much of a DIYer but, I do want to tackle projects around the Chalet and with help from my husband I’m learning how! We have an old oak chair in our bedroom that holds extra blankets and pillows at bedtime. Last month I had a light-bulb moment… I have a lot of different fabrics from Fabric.com in a bin waiting to be made into Pillow Slip Covers and this time I decided to upgrade the chair and introduce another lovely blue and white pattern into our bedroom. Isn’t she sweet - I have no idea how old she is. (she’s old) To the best of my recollection she was in the basement at my parents while I was growing up. Previously she’d even been a desk chair for my husband and then she sat in our basement here at the Chalet - until I thought she’d be a good option next to my highboy dresser. What a change in about an hour! I love how it turned out! Let’s talk about the Bolster Pillow we installed in our sons room. When I redesigned Liam’s room last summer - I knew having his bed against an outside wall would necessitate a pillow option when the temperatures dropped. The only way to stop the cold from transferring to his bedding was to build a Bolster Pillow and attach it to the wall leaving an air-gap. I drew it out and went to JoAnn Fabrics picking out foam and Blue Microfiber fabric. Friends I love me a good Microfiber and lucky for me my hubby had wood on-hand to make the backer. Installing the Wall Cleat was the first step. Then hanging the backer to make sure it was level and the gap was correct. It came together quickly. 1 sheet of MDF, 1 Cleat on Backer, 1 Wood Strip at bottom of Backer board to hold square to wall. A little time with the staple gun and finito! Here it is friends! Liam loves that he can sit on his bed Sofa style! I love that I don’t need to jam a million pillows and blankets between his bed and the wall. 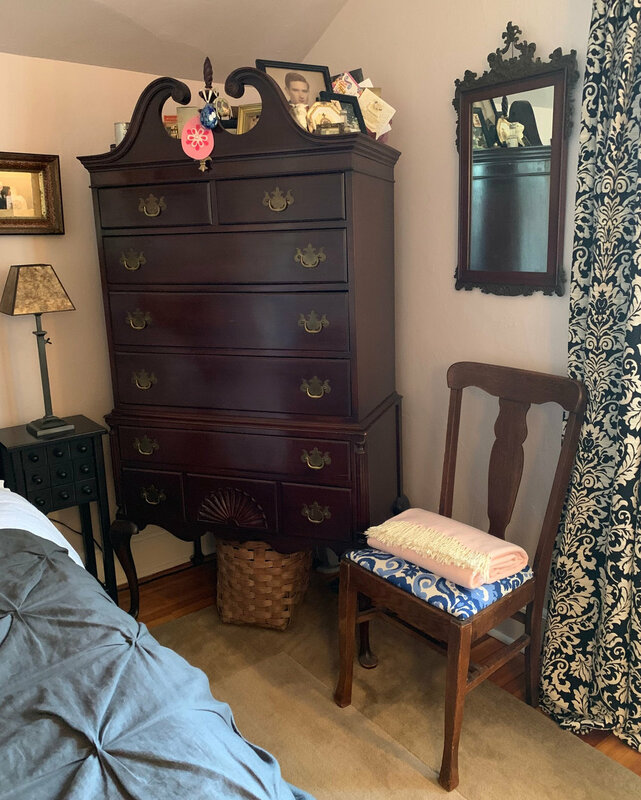 Living in an older home has it’s charms but, it also has it’s challenges - I am thrilled that we were able to tackle this one with a wonderful result! 1 Wood Strip to hold the backer board square to wall. About 2 hrs of time - For Build and Installation. Additional time to source materials. Til next time! Here’s to creating what YOU need! 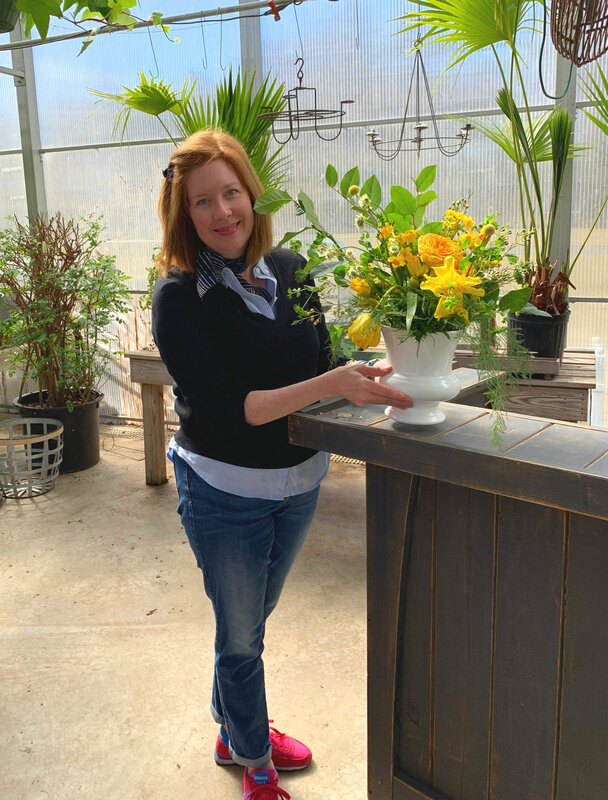 On Saturday March 23rd I had the great good fortune to be a participant at a Floral Design Workshop at The Herbary Bear Creek Farm in Howell, NJ. Yes, the same creative spirit that designed this gorgeous arrangement Dana Dore headed the workshop. I’m a big fan of Dana’s through Instagram and I jumped at the chance to hop in the car for a bit to meet her in real life and learn from this talented lady! Here’s Dana in the Greenhouse about to the start the workshop - and the finished arrangement we’d be creating. Below the worktable at the ready. To get started each participant had a vase with greenery and flowers that had been prepped for us and we each had a vessel and sheers. Once we had manipulated our chicken wire into place we started building our arrangements. 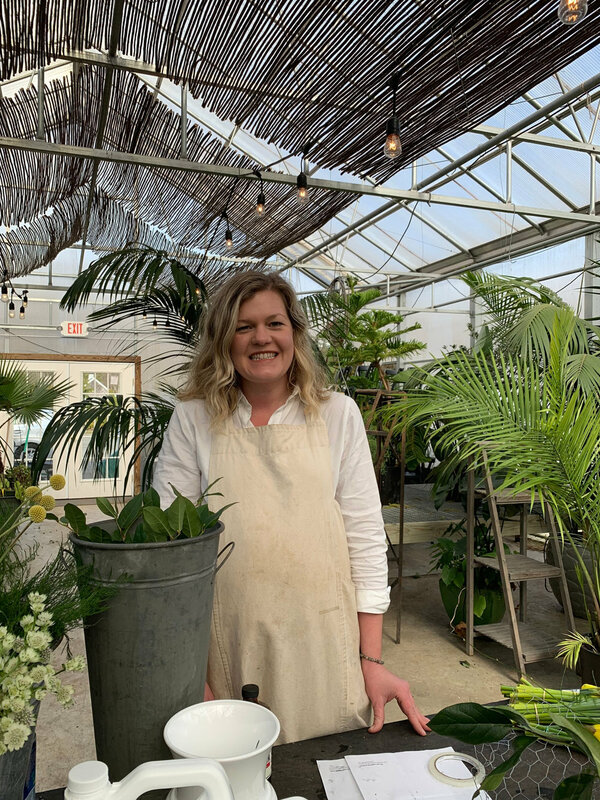 Dana is the Creative Director at the Herbary and she shared so much knowledge with us about how she builds an arrangement - her tools to achieve the best look possible. It was so informative. I have been displaying flowers in the Chalet for years but, I had no idea the concepts that go into Floral Bouquets. If you are within an hour or two I would highly recommend attending one of her workshops. 494 Lakewood Farmingdale Rd, Howell, NJ 07731 I know I’ll be returning - I already have four friends who want to attend the next! I must say I am pretty proud of what I did! And the flowers smelled amazing! Thank you again Dana it was such a wonderful treat all the way around! You’re a joy! The Herbary is available for private events. They held an event on the evening of March 23rd - look at this stunning set-up! They also have a lovely gift shop and cafe and are conveniently located not far from the Garden State Parkway and Shore points. 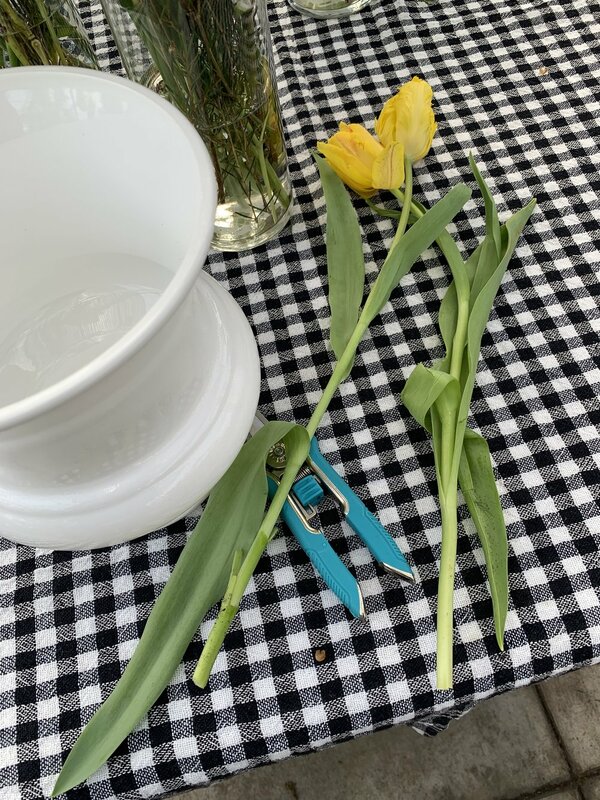 I wanted to share this image… after 6 days I took the original arrangement apart, trimmed, re-watered with floral fresh and rebuilt it in a smaller vessel using all I learned from Dana during the class. Again many many thanks Dana!!! Til next time my friends… I hope you try something new! I’ve been a fan of black in design for years. I’m sharing some images I’ve collected and what I think about the trend that has really grown legs over the lasts few years. I’ve kept every single issue of Domino Magazine published - in it’s premiere issue shown left from Spring 2005 Designer Ruthie Sommers graced the cover and had the most scrumptious home I’d ever seen. This was pre Instagram … pre Pinterest. Finding a magazine that showed spaces we wanted to live in… by cool people and the fact that it shared how to shop those designs… Like To Know It can thank Domino as the originator… but, I digress…The image above is from that issue. Dark walls are common place in 2019 oh but not so 14 years ago. This image literally blew my mind! Here are some more that are just so good!!! BLACK: LACKING HUE AND BRIGHTNESS; ABSORBING LIGHT WITHOUT REFLECTING ANY OF THE RAYS COMPOSING IT. This dark rug really started my wheels turning… this design… white walls dark rug with light leather is the design I have in my minds eye for the walk out basement level here at the Chalet. My friends Christina’s livingroom is a space I really admire - the comfy camel leather couch, mud cloth pillow and that dark rug! I do a Friendly Friday every week on the Gram - I share a grid of beauty from my saved images. Every week I focus on a different theme usually tied together by color…. I hope you’re following along over there! Are you a fan of black in design or decor? Do you use it in your own home or your clients?